Primary objects of the proposed investigation. 1. The modes of inception, the types of progress and the final stabilization of adult patterns during the second decade, for the explicit purpose of understanding and fostering those traits which determine a proper attitude of family-building ambition in contrast to careless production of children. 2. The physical and mental patterns of infancy and early childhood in the light of heredity and nurture. 3. 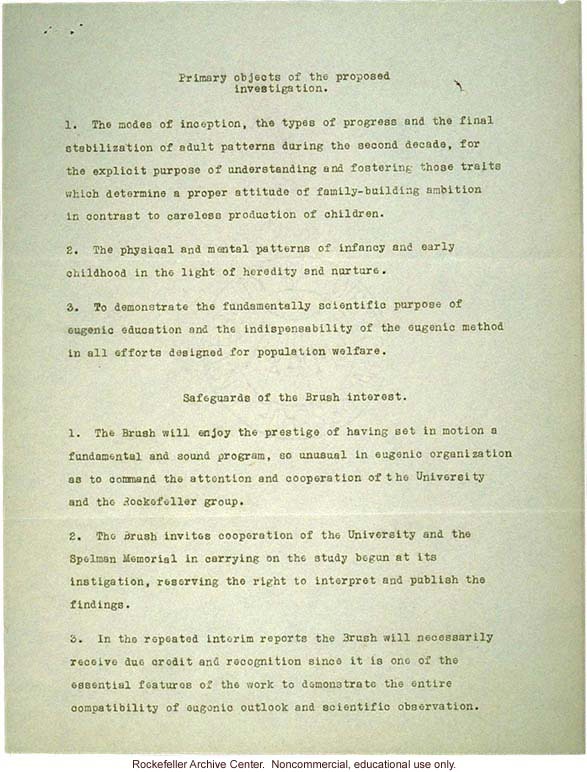 To demonstrate the fundamentally scientific purpose of eugenic education and the indispensability of the eugenic method in all efforts designed for population welfare. Safeguards of the Brush interest. 1. The Brush will enjoy the prestige of having set in motion a fundamental and sound program, so unusual in eugenic organization as to command the attention and cooperation of the University and the Rockefeller group. 2. The Brush invites cooperation of the University and the Spelman Memorial in carrying on the study begun at its instigation, reserving the right to interpret and publish the findings. 3. In the repeated interim reports the Brush will necessarily receive due credit and recognition since it is one of the essential features of the work to demonstrate the entire compatibility of eugenic outlook and scientific observation.